Sometimes you just need to get away, and this trip was exactly about getting out of New England. John had to travel to Atlanta for work and we had friends who had recently moved to Chattanooga, so I decided to tag along for a few days. Since the trip wasn't photography specific, and the location and time of year wasn't exactly prime for good photos, I packed light, taking only a 5D Mark II body paired with a 50mm f/1.4 lens. Our itinerary was simple - a late flight to Atlanta, two hour drive to Chattanooga for the weekend, then back to Atlanta for a couple of days. While we managed to pack a lot of activity into a few days - we visited friends, went rock climbing, and spent an entire day exploring the Georgia Aquarium - the best photo opportunities presented themselves on our drive from Chattanooga back to Atlanta. John took the scenic way through Chattahoochie National Forest and we lucked out with some beautiful fog that I think made the most of the late autumn foliage. While we didn't do any hiking and all the photos I took were from roadside pull-offs, I feel like I got many beautiful images. Fog settles in the forest along highway 60 in Georgia, creating a eerie mood. Leaves still clinging to their branches show hints of late autumn color through the fog in Georgia's Chattahoochie National Forest. 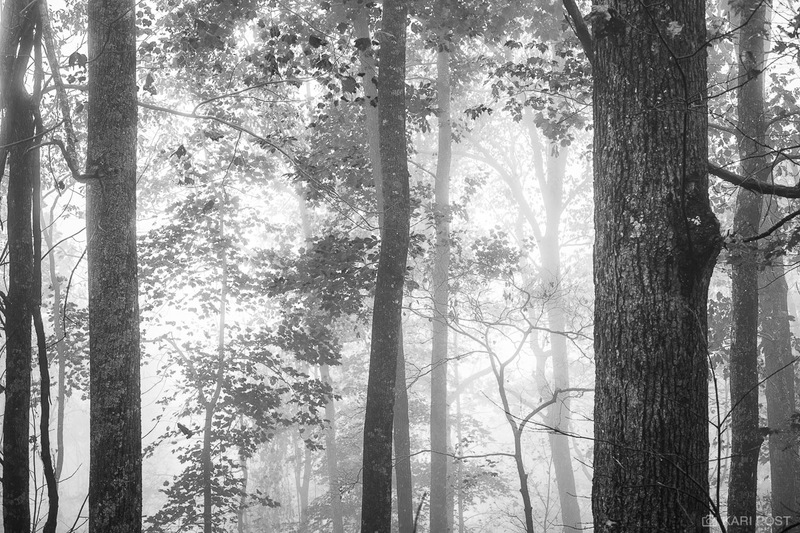 A black and white take on a foggy forest scene introduces contrast to an otherwise soft and delicate photograph. Fog creates a soft light in the forest, through which autumn leaves show hints of the season. Tree trunks and branches peak through the damp air as fog shrouds the forest. Fog in Chattahoochie National Forest creates a mysterious feeling as the leaves turn color with the changing of the seasons.